With more than one billion active monthly users, standing out on Instagram is hard, but getting people to click that all-important “Follow” button is even harder. For most businesses growing an engaged Instagram following is a high priority, but promoting your account can be tricky if you meet most of your clients at conferences, events, or meetings. Having to spell out your Instagram handle every single time can be annoying, time-consuming, and lead to misunderstandings if a potential follower gets the spelling wrong. Luckily, Instagram have just introduced a brand new feature that lets users create a Nametag that can then be scanned by soon-to-be followers. This quick and easy new system means you can avoid having to painstakingly spell out your handle and gather new followers at every conference, meeting, and event you attend. The idea behind this new feature is already available on other social media networks, like Twitter, Facebook, and Snapchat, where users can create their own personal QR codes that can be quickly scanned to bring up their account - and it’s the same for Spotify too. So, really, it was only a matter of time before Instagram did something similar. But, in true Instagram style, the platform has gone one step further and allows users to customize their Nametag, creating a kind of digital business card that links directly to their profile. Users can change the design and color of their Nametag to give it a personal feel and even add a selfie to it, which has proven to be big hit with the predominantly visual platform. Ready to create and customize your personal Nametag? Here’s how you can do that. Firstly, you need to get yourself into the Nametag section of Instagram. To do that, simply go to your profile and click the three horizontal lines in the top right corner. You should then see a square logo-like image appear that has your Instagram handle in it and the Instagram logo. Click the square image to get to the customization page. Once you’re there, you can customize your Nametag in three different ways: with emojis, with selfies, or with a change of color. To choose which option you want to go with, tap the button at the top that says “color”, “emoji”, or “selfie” to switch between the three. The simplest option is to customize your Nametag by changing the background to your favorite color. Once you’re in the “color” mode, just tap the screen to roll through the color options available and choose the one you like best. In the emoji mode, you can set the background to show your favorite emoji. To select different options, tap the screen and the emoji-selection panel will appear. Finally, you can add your own face to your Nametag in selfie mode. When you’ve toggled to the selfie option at the top, you’ll be prompted by the app to take a picture of yourself. It’ll then appear repeated in the background of card. When you’re done choosing with customization method you prefer, just tap the X in the top left corner and your selection will be saved. 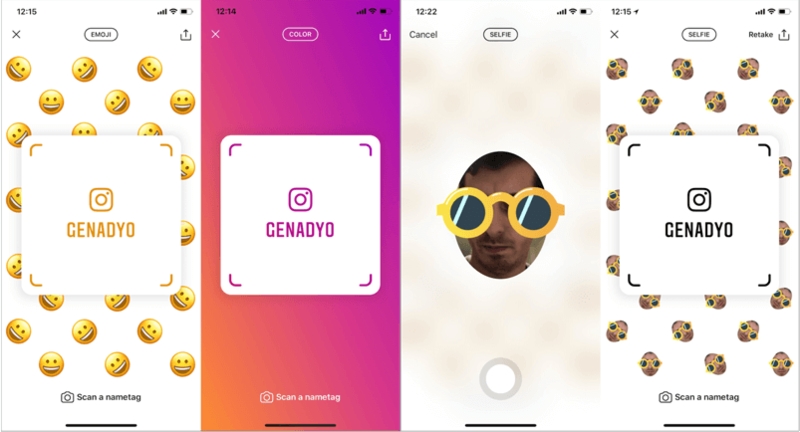 Now you have your Instagram Nametag customized to reflect your brand or individual tastes, you can quickly guide new followers to your account by opening the app and navigating to your Namecard and allowing them to scan the screen. But, if you’d rather not have to keep getting your phone out (or if your phone battery dies), there’s another option. With Brandly, you can print out your customized Nametag cards so that you have real, physical copies of them to hand out to people you meet in person. Much like a traditional business card, your Nametag will reflect your brand and be a physical reminder for potential followers to check out your Instagram account. If one of your top goals is to grow your Instagram following, a printed Nametag might just be the answer. As a concrete call-to-action that offers potential followers a really quick and easy way to see your profile, it can help you stand out from the competition that simply put their Instagram handle on a business card and hope that prospects are forward-thinking enough to open their Instagram app, type in the handle, and hit the follow button. Stay up-to-date with the latest trends in business cards and sign up for our newsletter.